No Roundup last Friday but I did get the Ducks over the Kings on Thursday correct. The win puts me at 58-55 on the season. Instead of going through the debacle that was the Flyers’ weekend, we’re going to talk Stadium Series! Quick fact about the Bruins/Flyers game: the Boston Bruins are the only team in the NHL that have a winning record in Philly, that even beats the Russians. 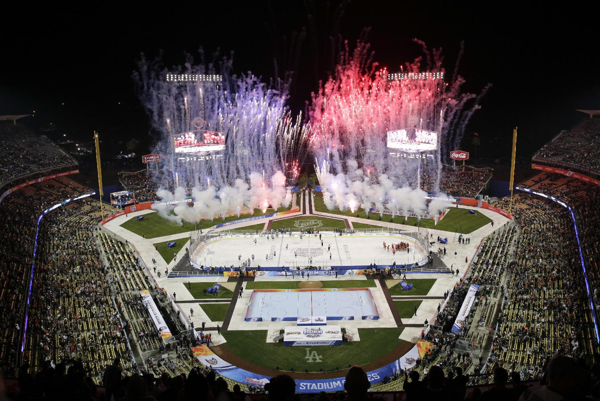 At Dodger Stadium, Los Angeles put their own twist on the outdoor game. The first response I heard from everyone I talked about this game was “How are they going to play an outdoor game in Southern California?” Well the crew at Dodger Stadium pulled it off in 63 degrees and high humidity and even put a beach volleyball court in left field. The game itself was won by the Anaheim Ducks 3-0 over the Kings on the back of goaltender Jonas Hiller. Hiller stopped all 36 shots from the Kings plus a penalty shot from Anze Kopitar in the first period. With Wayne Gretzky, Vin Scully, and KISS on site, the NHL could not have been happier about the result of this event. They would have hoped for it to sellout before the morning of the event but the crowd 54,009 was something the players great appreciated. I would have loved to see the Ducks rename themselves of the “Los Angeles Ducks of Anaheim” or both teams to wear red/blue as a nod to their cities respective baseball teams, but that is a tall order. Both teams’ jerseys were awesome, but I was bummed that those rumors of the return of the Mighty Ducks of Anaheim jerseys turned out to be just rumors. 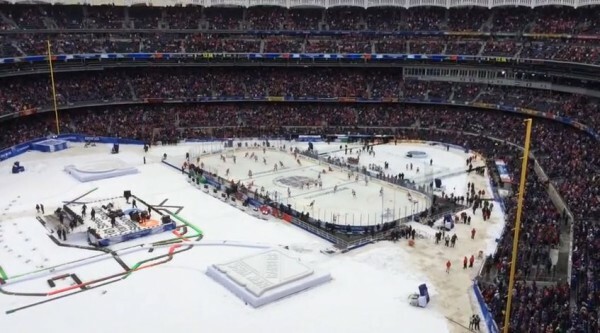 Yankee Stadium was (almost) exactly what we expect out an outdoor game. As you can see, there was snow on the field and it was extremely cold out. However, I say almost because there was a 60 minute sun delay. Once the clouds returned to stop the sun from reflecting off the ice, this game was good to go. During the delay, Rangers goalie Henrik Lundqvist took a nap, which affected him in the first period as the Devils led 3-1 at one point. However, the Rangers scored six straight goals to win this game 7-3. Like at Dodger Stadium, this game had a crowd of over 50,000 fans. I thoroughly enjoyed the Devils’ return to their original red and green but I wasn’t a fan of the Rangers’ white jerseys, which we’ll see again on Wednesday Night. In case you didn’t know, the Rangers have to be the away in both of their games at Yankee Stadium, despite being the closest team to Yankee Stadium. This is because of a deal they have with Madison Square Garden that doesn’t allow the Rangers to be the home team in a game that isn’t played at the Garden. Ultimately, it was a great weekend for the NHL giving two cities their first outdoor games. The ice wasn’t the highest quality, but the players loved the experience. But at the end of the day, it still counts just the same. It’s still just two points for the win. It’s nice to see these cities host outdoor games, but now we’re starting repeat. Wednesday is back in New York and the Penguins and Blackhawks play at Soldier Field later this season. Granted the Hawks hosted the Red Wings at Wrigley Field, but is it worth making the Winter Classic less special? In my opinion, it does take away the awe of the Winter Classic but outdoor games spread the awe of hockey itself. The sport was recently ranked the least popular of the four major sports in America and less popular than NASCAR by a recent Harris Poll. Outdoor hockey games, Winter Classic, Stadium Series, or even non-NHL games such the Frozen Fenway series in college hockey, attract a new audience. The league loves it because of the ticket revenue and as a hockey fan, you should love it because it can raise the popularity of this great sport. Six games around the league tonight. Three to keep an eye for are: Bruins @ Islanders at 7, Avalanche @ Stars at 8:30, and Kings @ Sharks at 10. Bruins over Islanders: This will be a lot closer than you think because the Islanders have played very well recently and well against great teams at home. The Bruins are just too good though. Avs over Stars: Dallas’ losing streak and Colorado’s winning streak have both been snapped, but the Avalanche are just a more talented team this season. Sharks over Kings: The Kings are riding a three-game skid and the Sharks are on a four-game winning streak. LA will get chomped tonight.